Aga stoves are made by the manufacturers of the world famous AGA range cooker. They are assembled by hand by skilled craftsmen, giving each one a personal touch and unique quality. Nothing is better for retaining and radiating heat than cast iron and nobody knows how to work with cast iron better than AGA. A pebbled finish, cast iron high output stove from Aga. 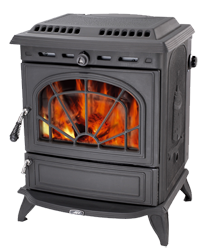 Visit our Aga Berrington Stove page. 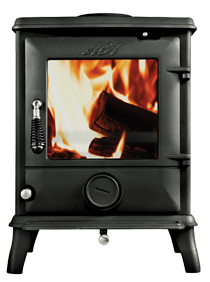 Wood burning version of AGA's best selling cast iron stove. 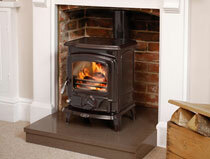 Visit our Aga Little Wenlock Classic SE Stove page. AGA wood burning cast iron stove. 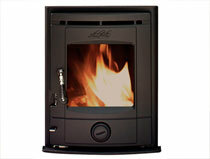 Visit our Aga Ludlow SE Stove page. The look of a traditional open fire with this AGA cast-iron stove. AGA cast-iron stove. 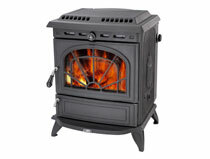 Visit our Aga Rembrandt Stove page. 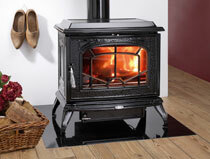 A renewable, clean-burning wood pellet cast-iron stove from AGA. 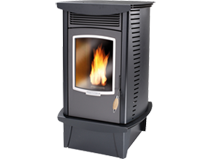 Visit our Aga Fusion Pellet Stove page. AGA solid fuel and wood-burning cast-iron stove. 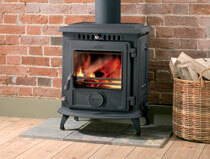 Visit our Aga Little Wenlock Stove page. Heats home and water. 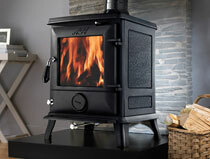 AGA's solid fuel and wood-burning cast-iron boiler stove. Visit our Aga Minsterley Stove page. The look of a traditional fireplace with the benefits of an AGA cast-iron stove. 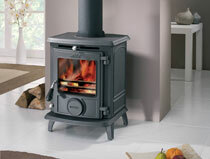 Visit our Aga Stretton Inset Stove page. AGA solid fuel and wood burning cast iron stove. 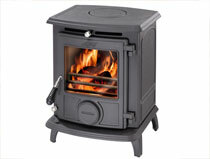 Visit our Aga Little Wenlock Classic Stove page. Understated style, classic design. Traditional or contemporary setting. Visit our Aga Ludlow Stove page. A higher output, larger version of the Little Wenlock. Visit our Aga Much Wenlock Stove page. AGA wood burning, cast iron, smoke exempt stove. 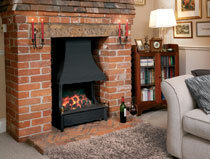 Visit our Aga Stretton SE Inset Stove page. "To make a stove which is both beautiful to look at and practical to run, you have to start with the right materials – a high quality metal, which is precision cast and expertly finished by skilled craftsmen." For over 80 years AGA have remained at the forefront of engineering excellence. AGA stoves embody the best AGA traditions and employ the very latest technology. The generations of workers who have bestowed their craft, often from father to son, have done so with great care and attention, bringing a sense of pride to each new stove. 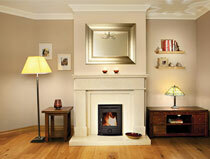 When you invest in an AGA stove, you are acquiring a piece of history, a talking point and a centrepiece for your home. Made by the manufacturers of the world famous AGA range cooker, they are assembled by hand by skilled craftsmen, giving each one a personal touch and unique quality. Nothing is better for retaining and radiating heat than cast iron and nobody knows how to work with cast iron better than AGA. Cast iron is renowned for its heat retention properties, which is why Aga use it in their world famous AGA cookers. The heat stored whilst the stove is lit continues to be released into the room, long after the embers have died away. AGA stoves are manufactured to the highest possible standards. They carry the CE mark, which means that they comply with the essential requirements of the relevant European health, safety, environmental protection legislation and are all HETAS listed. 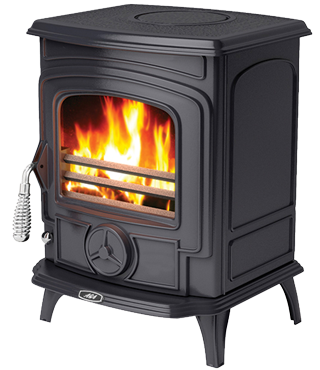 All stoves have a five year parts and one year labour warranty. 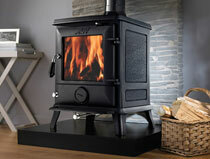 County Woodburning Centre's best selling Aga stoves are the Aga Little Wenlock stove and the Aga Ludlow stove. The stoves are all capable of producing a substantial level of heat. Please ask us about the most suitable heat output for your intended installation. Contact County Woodburning Centre on 01724 844872 and our friendly, knowledgeable staff will answer your questions about any of the Aga stoves shown on our website. Alternatively, why not visit our 3,000 square foot Lincolnshire stove showroom where we'll be happy to light up one of our Aga stoves so you can see these beautiful woodburners for yourself. The cast iron panels of an AGA stove are individually moulded in a hand finished 'cast'. This means that we can create the gentle curves and exquisite design details which are the hallmark of a high quality stove. AGA stoves are available with a cast matt finish or a high quality vitreous enamel surface.